Welcome Home to 22022 Antiqua!!! This well-appointed end unit condo boasts 3 bedrooms, 3 full bathrooms, and approx. 1550 sq ft. As you enter this open floor plan with high vaulted ceilings you will be greeted by new bamboo wood flooring, new custom paint, and a beautiful statement piece fireplace. The light and bright gourmet chefâs kitchen has been remodeled and features an oversized kitchen island, all new shaker style kitchen cabinets, stainless steel appliances, glass tile backsplash, and recessed lighting. Also located on the first floor is the living room, dining room, a downstairs bedroom and a full bathroom. The upstairs of this home features an oversized master bedroom with a large private balcony. The master bathroom features dual vanities, a walk-in closet and a separate shower. Also, on the second floor is an additional bedroom and another full bathroom. The home has a direct access 2 car garage that you can access from the kitchen. The home features a private backyard which is perfect for entertaining. 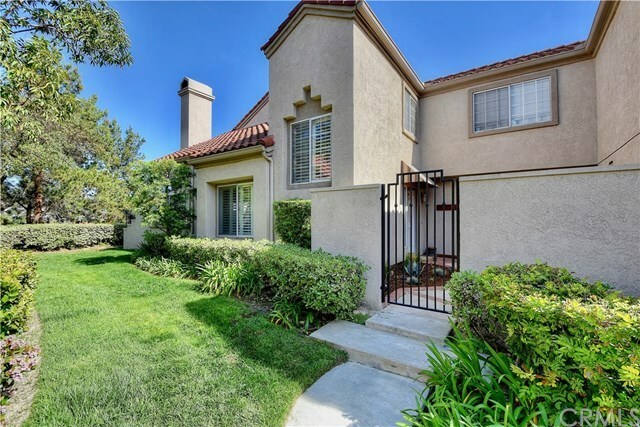 Amenities to this desirable community are pool, spa, tennis, membership to the fabulous Lake Mission Viejo within a block from your front door. Enjoy swimming, boating and spectacular summer concerts. Hurry this home wonât last!! !